I love Thanksgiving: the food the food and the food. 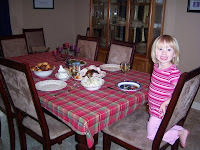 It is amazing that I spent several hours throughout the week and many more hours Thanksgiving morning preparing all the food, we spend about 15 minutes actually eating, and then Rocky, during the clean up, always remarks about just HOW many leftovers we have. Of course, I could have bought a smaller bird, made fewer potatoes, but there's just something about the smell of that large bird roasting away, the giblets flavoring the juices that will turn into gravy. (And yes, the gravy turned out yet again, though I made too much roux to start with and ended up with more gravy than we will EVER need). I love the Thanksgiving afternoons of lazing around, watching football, playing Candy Land with Maggie and reading through the Black Friday ads to see if there's any saving just soo enticing that we MUST head out bright and early tomorrow morning (as usual, there is not). Currently, I'm trying to decide when to start the apple pie, Maggie is "reading" her Sponge Bob book using her Leap Frog Tag pen, and Rocky is watching the pre-game show for the Cowboys/Raiders game.